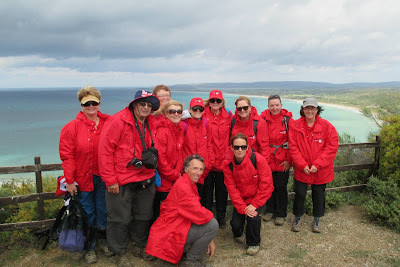 Tararua locals in Queensland - amazing coincidence! 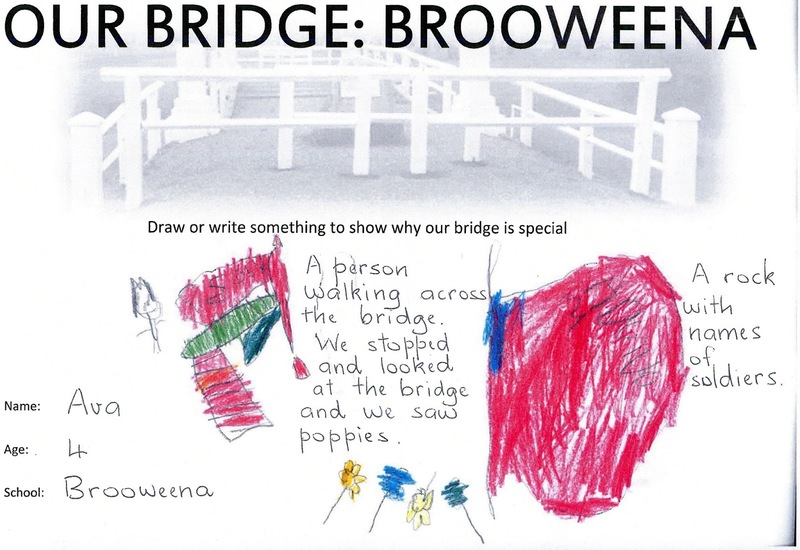 Thanks to the children of Brooweena State School for getting involved in the Anzac Bridge project. 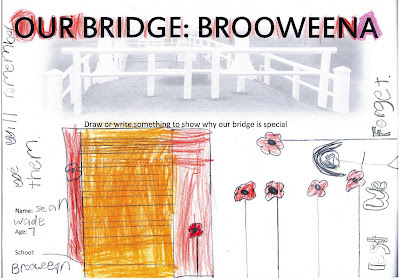 Here are just some of the lovely drawings and writing they produced about their war memorial bridge at Brooweena and why it is so special. At the Anzac Day service at Kaiparoro war memorial bridge, the names of the nine fallen from Brooweena were read out, and a wreath was laid for them. Today is a day on which we remember all New Zealand and Australians who served and died in war and on operational service. 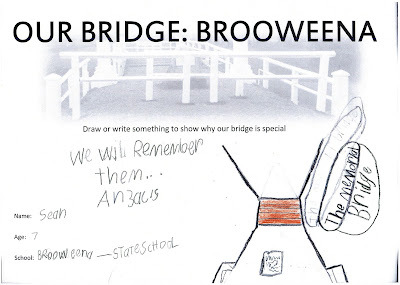 The Spirit of ANZAC with its qualities of courage, mateship and sacrifice continues to have meaning and relevance for our sense of national identities. 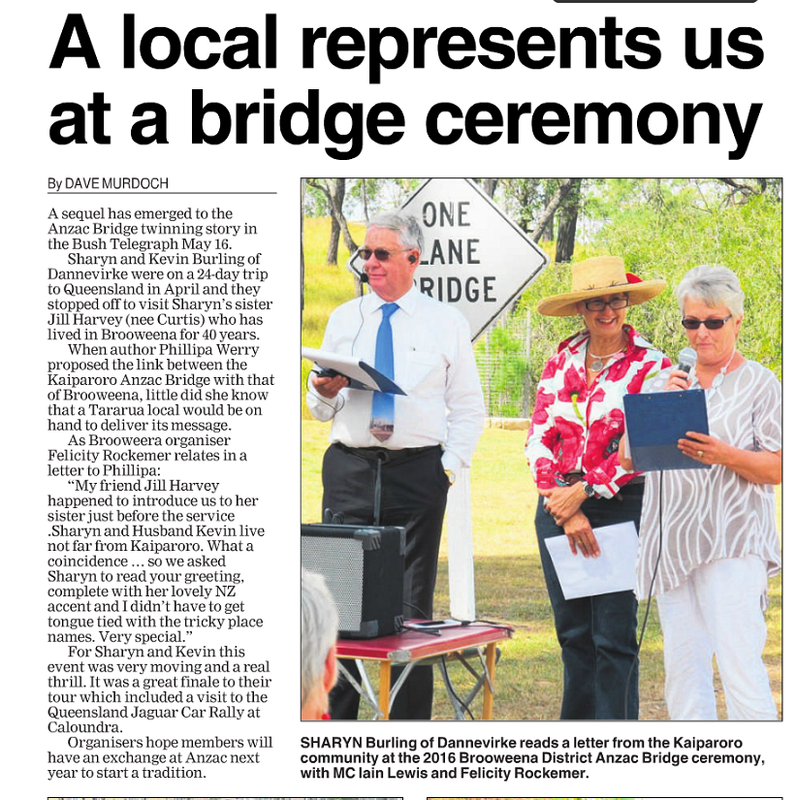 Mateship continues with this link between our two unique Bridges in a bond that was forged on this day so long ago. We remember those who served our countries and reflect upon their selfless sacrifice and also acknowledge the losses and sacrifices of their families. 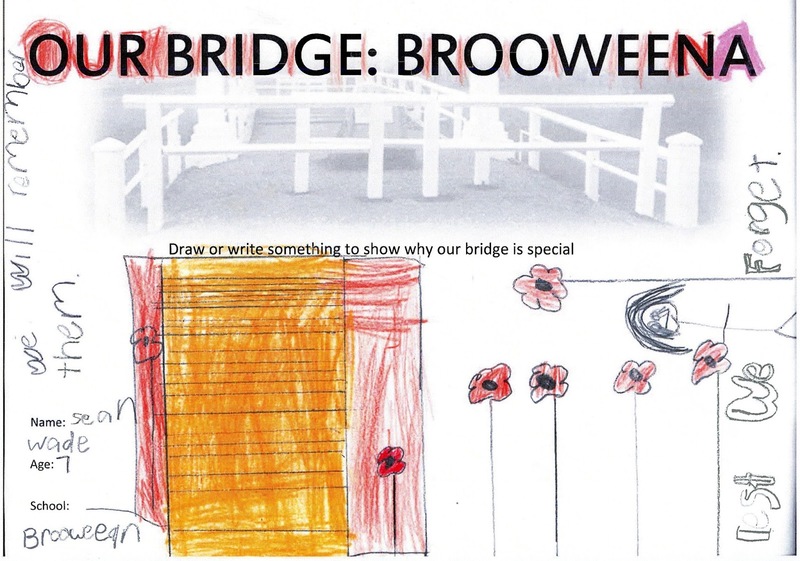 Our bridge, of wooden construction with concrete piers, though not so grand as yours, is the only privately erected War Memorial in Queensland. 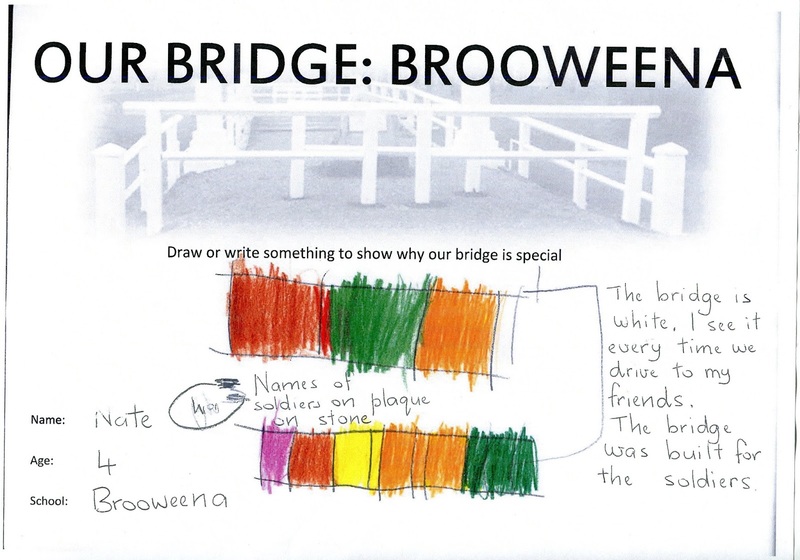 It is situated 19 km south of Brooweena, a very small township in South East Queensland. It was designed by Laurence Stevens Smith then the owner of historic “ Mount Joseph Station” which is situated opposite. It was constructed by Frank Fallon along with Station hands from Mount Joseph and a number of returned servicemen from the district. It was officially opened on 21 May, 1921. 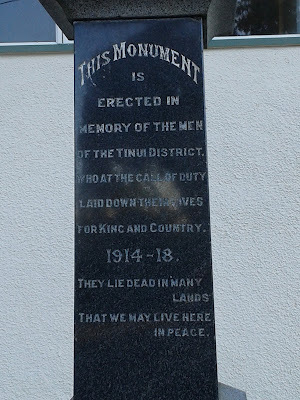 The Fallen of WW1, 9 local men, are listed on one pier and directly opposite are the names of the Returned Soldiers. It is uncanny that the number should be the same as your bridge and that both bridges were constructed with the help of the Returned. 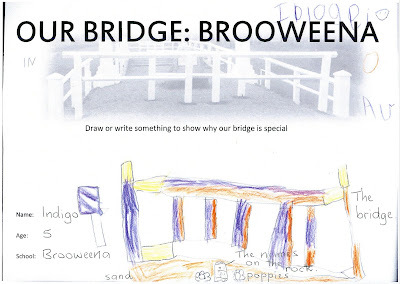 The bridge carried traffic on the Woolooga Road for over fifty years, ceasing on 16 June 1972 with the completion of a new adjacent road. 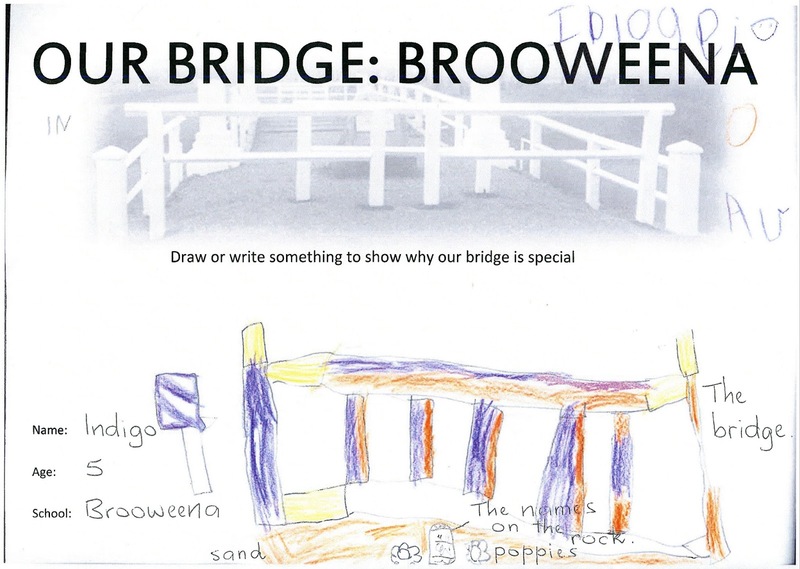 Restoration works were carried out in 2008 by the staff of the Woocoo Shire Council together with invaluable input from several local residents. Today the bridge is cared for by the “Friends of the Bridge” in conjunction with the Fraser Coast Regional Council. 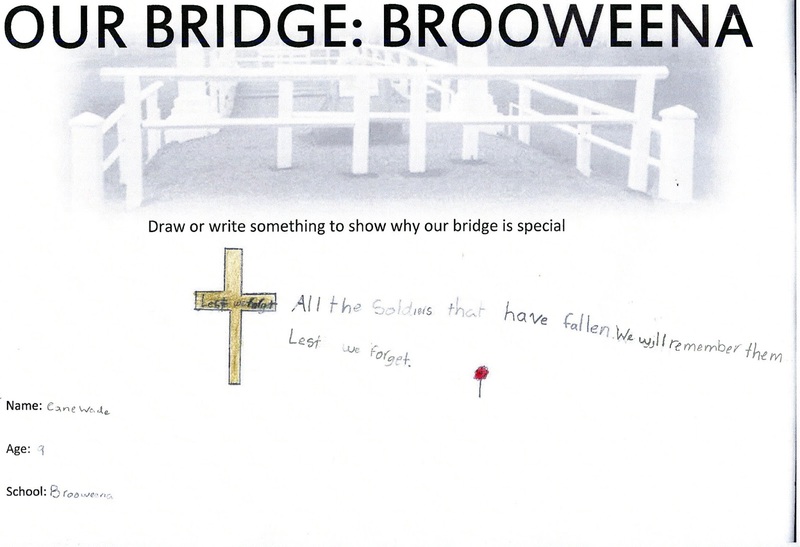 Each year since 2009 on Anzac Day we hold an informal service followed by a picnic lunch. 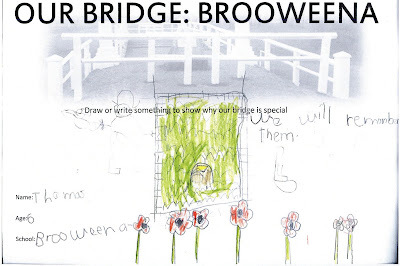 We remember our fallen and returned, children recite poetry, we tell stories in relation to our fallen, raise our flag with pride, lay wreaths to the eerie sound of bagpipes by our lone piper, and give thanks for the freedom we enjoy. The Anzac spirit exists in each of us so therefore let us be guided by that ANZAC spirit in facing national and personal challenges ahead and let us strive to be worthy of the memory of those we honour today! 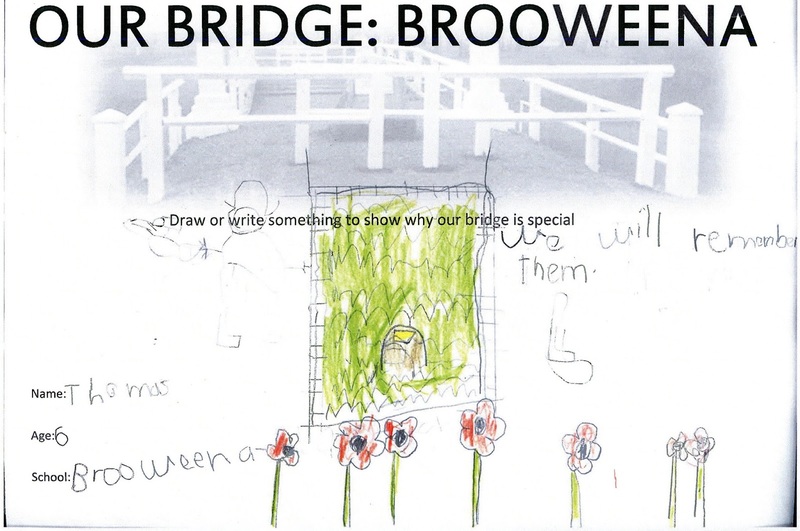 We will include the names of your fallen in our Service and remember the friendship between your country and ours and the link that has now been “bridged”. We look forward to strengthening that bond and continued correspondence in the future! 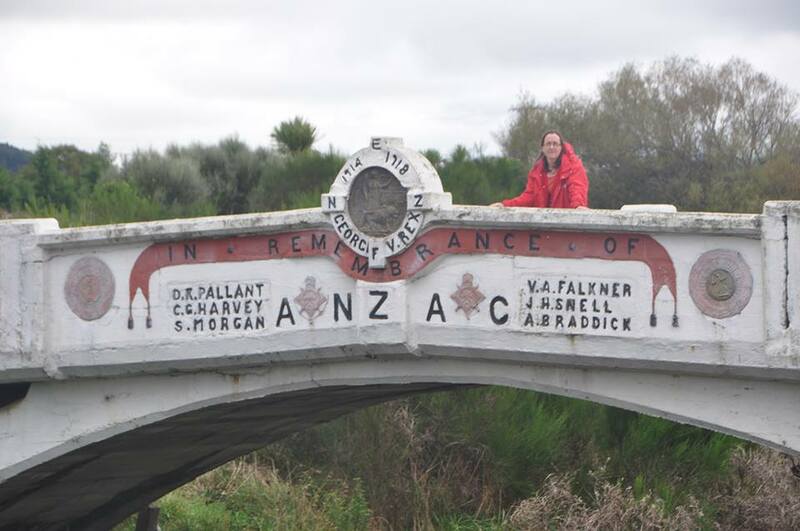 More about Anzac Day at Kaiparoro: "it' s just such a lovely spot." It's out in the country, surrounded by beautiful farmland and green hills. I'm not used to Anzac Day services where you can see cows and hawks. You also get to see a flyover by the Vintage Aviation Collection! It's a true community event. People bring their dogs. Someone had handpainted poppies onto the rocks in the field beyond the fence. It's for the wider community as well. 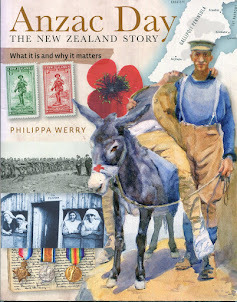 Some people had travelled from as far as Hawkes Bay, Wanganui, Horowhenua and the Kapiti Coast. It's very personal. The roll of honour is read out for the nine names on the bridge, and after each name, family members go forward and lay wreaths for that person. Each year, one name is chosen and a relative gives a short biography of that person; this year it was Charles Harvey. At yesterday's service, the Deputy French Ambassador, Clarisse Gerardin, gave a very moving speech about how her family had been caught between the front lines in World War One and eventually had to be rescued by the Red Cross and relocated to Switzerland. When they finally returned to their farm, it was to find the land almost unrecognizable. For years they worked at restoring it, but they were constantly ploughing up remnants of old shells and even mangled human bodies. The service was also extra special this year for the new links forged between the bridge communities at Kaiparoro and Brooweena. There's a lovely article about the bridge here. 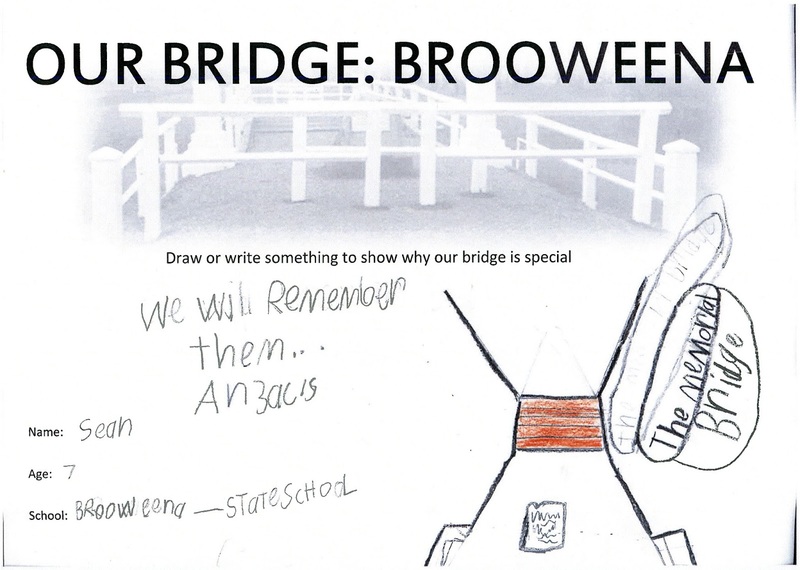 It makes the point that the Anzac memorial bridge is the country's only bridge built specifically as an Anzac memorial. 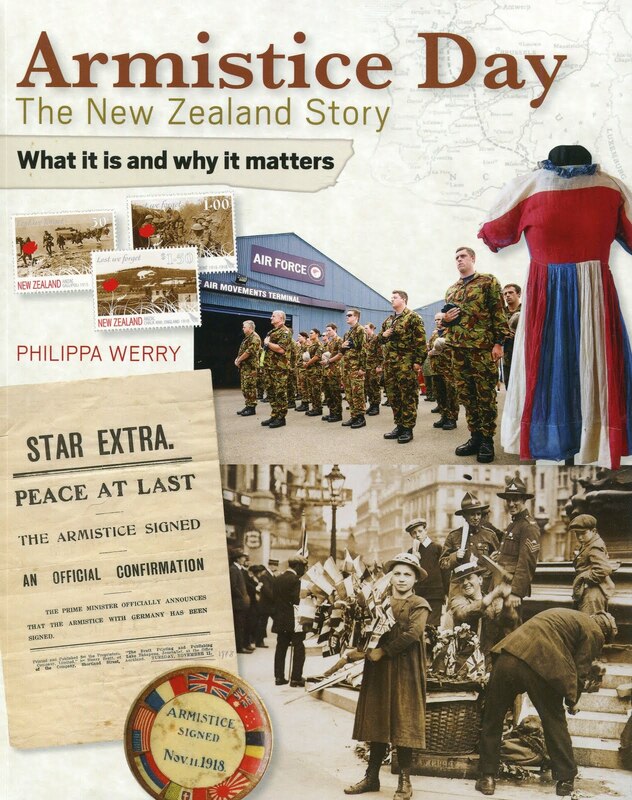 It also has some wonderful family photos, including postcards sent home by Charles Harvey, some of which were read out at the Anzac Day service by a representative from his family. 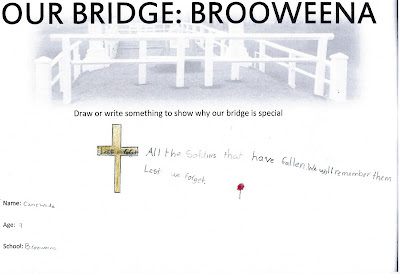 Only one of the WW1 soldiers commemorated on the bridge, Arthur Braddick, left any direct descendants. His granddaughter said: "I think it's just such a lovely spot, if you stand on the bridge and look down the valley you can see the land Arthur was brought up on, and left from... it's really beautiful." That we may live here in peace."